Original Japanese version, sans Raymond Burr and English dub, is a somber, frightening tale of the radioactive child of the H-bomb. Audiences identified with the monster and later films turned Godzilla into a cute hero. This one ends with a plea to stop nuclear testing. GODZILLA LIVES! On September 5, 2006 Sony Wonder released the definitive edition of the original GODZILLA motion picture, GOJIRA, on a deluxe two-DVD set (with an insightful 12-page essay by Steve Ryfle). 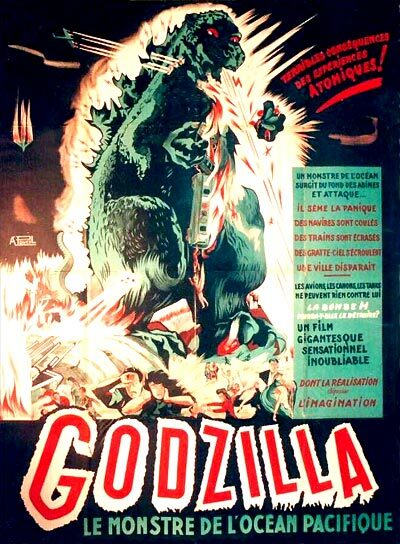 In addition to the atomically alegorical Japanese-made GOJIRA (Ishiro Honda, 1954), the package also includes the edited, 1956 Americanized version, GODZILLA, KING OF THE MONSTERS.